Working in media planning and buying I was forced to realize something I had rejected my whole life - sports are important and valuable. While time-shifted viewing continues to rise, sports are viewed live 99% of the time. This makes it a highly coveted area for advertisers. This year marked a new venue for advertisers with the debut of a four-team playoff in college football. When the system started ESPN signed a 12-year contract for $5.6 billion dollars in order to become the host of the playoff series. This is an average of $470 million per year. Although this doesn’t hold a candle to the whopping $1.9 billion paid annually for NFL on ESPN it is lot of money to invest in THREE GAMES… yes three! ESPN is paying more for three college football games than the annual GDP of Tonga. This large cost was even more daunting as this was an untested area. ESPN was quick to start promoting the playoffs in its inaugural year with a series of “Who’s in” promos. The failure or success of this year’s games would set the standard for pricing in the future. Lucky for them, it paid off. The National Championship Game brought in more than 33 million viewers and was the most-watched broadcast in cable TV history. This exceeded the previous record set 11 days prior on New Year’s Day with 28.3 million viewers for Ohio State’s win over Alabama in the semifinals. This will lead to increased demand and cost for next years games. Ad placement within the game can be tricky. Depending on how the game goes you risk a blow out that will leave your message to a smaller audience than you planned. Landing in halftime can also cost advertisers a lot of eyes. It is expensive! Sporting events are generally some of the most costly ads. A lot of people watch sports, but not all people watch sports. Even though more people are using streaming options or time-shifted viewing, the majority of people still watch television live. If you would like to look further into why sports (and your cable bill) are so expensive I encourage you to do a little digging into the deals made to secure the rights to these events. 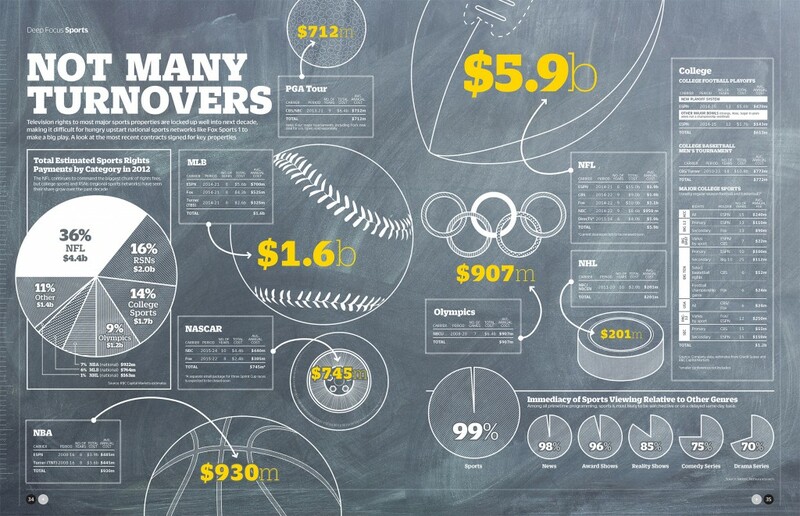 Below is a graph (click to enlarge) showing how this money divides up between different sports.